Ranked #1 for English SGS information! Contents Copyright Ricky Chua 2010. Powered by Blogger. Kingdom Wars - Back in stock! 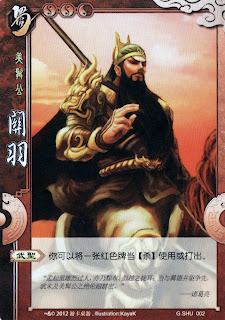 "The Bearded Gentleman美髯公(měi rán gōng) "
He is a god. No kidding. The legend of Guan Yu and his strong sense of chivalry and brotherhood has transcended two millenia and is still widely revered today in Chinese culture. Mention his deity name "Guan Gong 关公" and most elder chinese would relate to you legendary stories of Guan Yu's strong sense fairness, justice and brotherhood. The 2nd eldest among the three sworn brothers, Liu Bei 刘备, Guan Yu and Zhang Fei 张飞, Guan Yu is usually the most rational. Of course, his combat ability is incredible and his weapon the Green Dragon Crescent Blade 青龙偃月刀has become the stuff of legends. Character ability: "Warrior Saint 武圣 (wǔ shèng)"
You can use or play a red-suited card as ATTACK 杀.
Guan Yu has 2.5 units of maximum health instead of 2, differentiating him from other characters with 4 units of maximum health in normal SGS. Another character with this additional health is Lu Bu 吕布. Some joke that they eat their horse, RED HARE 赤兔, to gain an addition 0.5 units of maximum health. Like most of Shu kingdom's "combat" characters in the SanGuoSha 三国杀 card game, there is only a superficial link between their character ability and the story. In the case of Guan Yu, the game makers decided to make it easy for Guan Yu to attack other players. Unlike Zhao Yun 赵云 who has an advantage in dodging, Guan Yu's advantage only lies in attack. Perhaps its the game makers' way of paying tribute to Guan Yu's courage and raw power. Okay, one more reason is that Guan Yu has red face, so the game makers linked him with the corresponding ability in BANG! Guān Yǔ use red suited cards as attack, how if he combine to Zhào Yún ? red suited cards will used as attack and dodge????? ?